For detectors such as SiPM and APD, where the gain is depending on the supply voltage and to some extend on the temperature, iseg provides detector supplies with a temperature-dependent voltage correction per channel. For each channel the temperature is measured directly at the detector via a small external temperature sensor. The supply can be adjusted automatically at a very high resolution according to a temperature drift to compensate for changes in gain. The correction factor is user adjustable. The measured temperatures can be obtained via the interface. For highly sensitive detectors with a current consumption in the range of a few μA, such as semiconductor detectors, but also special drift or ionization chambers, high precision modules with a maximum output current of 100 μA are provided. This allows a resolution of the measured or set currents down to 100 pA. The stored energy in the HV channel is significantly reduced and the output current can be precisely limited to very small values for detector protection. 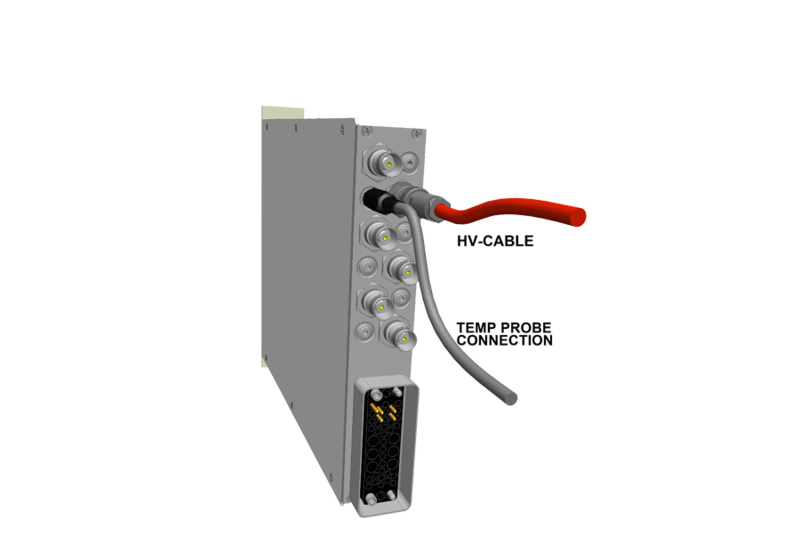 Programmable protection features such as KILL-ENABLE and the Delayed Trip with or without a voltage ramp are provided.